Stewart Island offers some of the best land and sea birding in New Zealand. Bird watchers come from all over the world to enjoy our birds. Largely unmodified, the Island provides excellent habitat and food for native birds. Unlike other areas of New Zealand, it has not suffered the introduction of mustelids. The sea surrounding the Island is rich in food and attractive to a large number of seabirds. Ulva Island is a jewel in the crown offering a predator-free environment for rare and endangered birds including South Island saddleback, mohua, rifleman, Stewart Island robin. 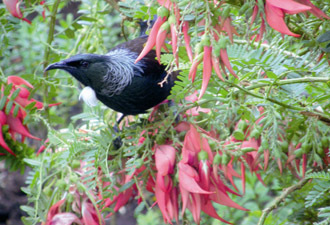 Birds, which are often seen on Stewart Island and Ulva Island, include bellbird, tui, kaka, tomtit, grey warbler, kakariki and the New Zealand wood pigeon. 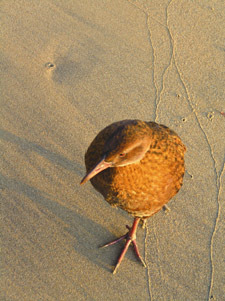 Some of our birds are unique to the region and include the weka, robin and fernbird. The Stewart Island Brown Kiwi or the Southern Tokoeka, Apteryx australis lawyri - is one of six identified species of kiwi. Kiwi are flightless and largely nocturnal. However, the Stewart Island Brown Kiwi is active during the day and night. Kiwi outnumber humans and it is estimated there are 20,000 on Stewart Island. They are not always easy to see, shying away from humans and rarely coming close to inhabited areas. Seabirds abound in our coastal waters due to the rich supply of food. Albatross, mollymawk, prion, petrel, cormorants and blue penguin are regularly seen. Sooty shearwater are seen in large numbers during their breeding season. Please respect our wildlife and especially Kiwi - do not approach them within 5 metres or disturb them in anyway. The following list of birds to be found on and about Stewart Island was originally compiled by the late Ron Tindall and was revised and updated by Matt Jones in 2018. Foveaux Shag Leucocarbo stewarti Formerly Stewart Island Shag, now split from mainland Otago Shag. Fairly common.